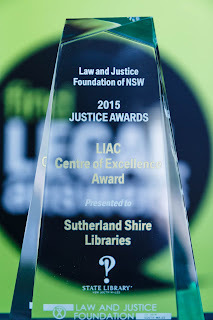 Sutherland Shire Libraries were awarded the 2015 LIAC (Legal Information Access Centre) Centre of Excellence Award for their work with the Sutherland Local Court. The award is part of the Law and Justice Foundation of NSW’s annual Justice Awards. The awards recognise the contributions that individuals and organisations have made to improving access to justice in NSW. Sutherland Library provided workshops for staff at Sutherland Local Court to learn about the Find Legal Answers service at Sutherland Library. The partnership resulted in increased referrals from the court to the library and an improvement in client service for people attending court. The Find Legal Answers service provides the community with free access to plain language legal information. Find Legal Answers can help you understand your rights and responsibilities on a range of everyday legal situations including family law, tenancy, debt, strata living, neighbourhood problems and wills. Staff can assist you at any of the Sutherland Shire Libraries or visit www.legalanswers.sl.nsw.gov.au.